Specializing in commercial ceramic tile and stone contracting for over 55 years, we have built an excellent reputation of top quality and on-time installations. Our large, professional workforce is able to complete any size project. A typical job for Modern Tile and Stone can range from $10,000 to $1,000,000, and we can provide bonds based on your project needs. We work throughout the North Texas area, but consider other areas based on individual project evaluations. We look forward to serving your needs in the future. Please visit “Portfolio” for a better understanding of our capabilities. 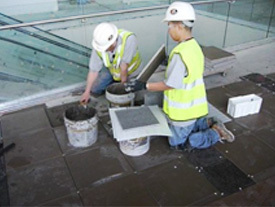 Modern Tile and Stone is primarily involved in the initial construction and/or renovation of commercial projects. We also provide the same level of service to high end residential projects. We will take your project from “plans” to “reality”, in a friendly and professional manner adapted from more than 55 years in the industry. Please see “Services” and “Portfolio” for additional information about our capabilities.